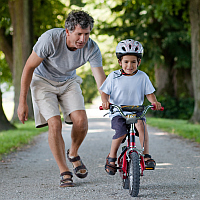 When you teach your kid to ride a bicycle: you hold his coat while he peddles and covers some distance. You are there with him, running along side him, yelling out calls, cheering him on. This is coaching. Coaching is different from consulting. In coaching, I come to your location and work alongside you. We meet together, plan together and use the same tools and technologies to get our work done. I’m a senior member of the team and the one you turn to when complications arise. Every moment is a teachable moment and I will stop us and guide us as each opportunity arises. The time I spend with your team is invaluable. All the books and articles you’ve read will begin to make sense and create numerous “ah ha” moments as we work alongside one another to produce a product. Consulting is not like coaching. In an consulting engagement, your team may call me for a phone meeting or an online video chat. You’ll be working on your own, making strides and then discover an issue for which you need guidance and clarification. Consulting can also be planned. In this case, we plan to talk once per week to review what you’ve done, are doing and any obstacles you’re finding along the path. Depending on location, I can come for those meetings or we can hold them over the Internet for that face to face meeting (very valuable as you know in agile). Now you know the differences between coaching and consulting. You can select the kind of assistance you need with your agile project and find the right person. 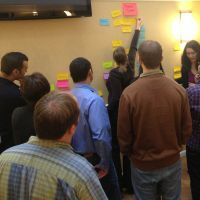 At SmitsMC, my Scrum Team Kick-Off Class uses a coaching approach. An experienced coach will work with you, leading your team through the important steps of using scrum to develop a product. The structure can vary, but here is a template that is often chosen because it provides a mix of learning, certification, coaching and delivering real product. Scum Team Kick-Off Classes take place at your training location. Learn more about the SmitsMC Scrum Team Kick-Off Class. “You mean, I get to play poker at work?” you ask. Well, kind of. Agile is an excellent discipline, but it is also fun! There are many games you can play to help you work better in agile. Poker Planning is one of these excellent tools. is an Agile estimating and planning technique. is a way for product scrum teams to estimate the backlog. is fun to use and promotes discussion. Learn Planning Poker in class with Hubert.